See linked items Willy Gerler: Zionist pioneering training in Loosdrecht; the escape through France and Spain to the USA. See linked items הכשרת ורקדורפ בוירינגן - הולנד: תקנון ההכשרה וכללי ההתנהגות בה. See linked items סופי ון קופורדן - סימון: מכתבים לאורי קוך. Sophie van Coevorden (later Adina Simon - Kochba), a member of the HeHalutz movement in the Netherlands. 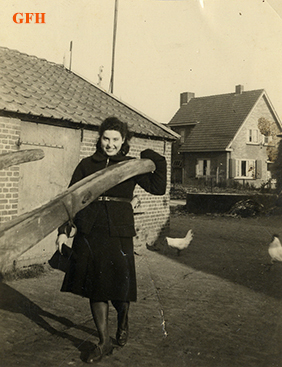 The photo was taken at the "Werkdorp" (work village) in Wieringermeer, evidently in the early 1940s. 1. For further information about Sohpie, see file 72 and 1276 in the Holland Section of the GFH Archives and file 23274 in the Holdings Registry. 2. The Werkdorp was established on 3 October 1934 at the initiative of G. Flatow, G. van der Berg and the Comite Voor Bijzondere Joodse Belangen (council of Jewish refugees), to advance vocational training in agriculture and crafts for young Jews from Germany. The village could accommodate some 300 people and was run by Jewish financing. The Dutch government stipulated who would be eligible to enter the village, for how long and the code of conduct. Young Jews about to immigrate to Mandate Palestine were accepted, in addition to Jews who were about to immigrate to other countries. From 1939 on more and more members of Zionist youth movements were brought there, including adolescents aged 15 - 17. On 20 March 1941, the Germans liquidated the Werkdorp. Most of its residents were transferred to the Mauthausen camp in Austria. Others were moved to farms in the northern Netherlands or remained in Amsterdam. Only 95 people remained in the Werkdorp for necessary agricultural tasks.